The first research reporting the productions of induced pluripotent stem cells (iPSCs) was announced five years ago. Since then, the field has made significant progress, encouraging high hopes that iPSCs could be so similar to embryonic stem cells (ESCs) that they could eventually replace ESCs in research and therapeutic applications. However, as with almost any new technology, there have been various problems along the way. These include incomplete reproduction of all important characteristics of ESCs, alterations of cell DNA that might cause cancer, and susceptibility of iPSCs to rejection by the immune system even of the donor of the reprogrammed cells. Further progress depends on being able to deal with these problems. In addition, depending on the method used to produce iPSCs, the process may be too slow and inefficient for practical use. The latest research demonstrates what appears to be an effective technique to significantly improve speed and efficiency of reprogramming. Researchers from the Wellcome Trust Sanger Institute have today (10/10/2011) announced a new technique to reprogramme human cells, such as skin cells, into stem cells. Their process increases the efficiency of cell reprogramming by one hundred-fold and generates cells of a higher quality at a faster rate. Until now cells have been reprogrammed using four specific regulatory proteins. By adding two further regulatory factors, Liu and co-workers brought about a dramatic improvement in the efficiency of reprogramming and the robustness of stem cell development. The new streamlined process produces cells that can grow more easily. The main function of adult stem cells is to enable the replacement of old or damaged cells of most types, from neurons to skin to the liver. One of the main reasons that organisms as a whole suffer from aging is that their adult stem cells do too, almost like any other cell type. However, in spite of telomere repair in stem cells, they still experience aging, so there must be more to aging than telomeres. One factor is the accumulation of DNA damage due to the inherent imperfections in DNA repair mechanisms. The research in question here compared young adult stem cells with cells of the same type that had been allowed to divide repeatedly in cultures, in order to determine what changed. One important difference found was the accumulation of DNA segments called Alu element retrotransposons. This type of noncoding DNA is common in primate genomes. However, the accumulation that occurs in aging stem cells appears to be toxic to the cells and eventually forces them into a senescent state. The good news is that when copying of these Alu elements is suppressed, stem cells are able to regain their self-renewing properties. Naturally, this is being investigated further for possible applications in slowing the overall aging process. Stem cell scientists are continuing to turn up new information on how embryonic (and other) stem cells work. Embryonic stem cells are pluripotent, meaning they can transform into any other cell type. But what determines when and how this happens? The latest research reveals one particular process, probably out of many. The FOXP1 gene codes for a transcription factor that regulates the expression of other genes important in embryonic development. As it turns out, very slightly different proteins can be produced from FOXP1, depending on a process, alternative splicing, that affects the derived messenger RNA. In one form of the final transcription factor, genes that maintain pluripotency are expressed: OCT4, NANOG, NR5A2, and GDF3. But in the alternative form, genes are expressed that cause the cell to differentiate into a non-pluripotent cell. The question remains as to what causes splicing to take one path or the other. Scientists have found a control switch that regulates stem cell “pluripotency,” the capacity of stem cells to develop into any type of cell in the human body. The discovery reveals that pluripotency is regulated by a single event in a process called alternative splicing. Alternative splicing allows one gene to generate many different genetic messages and protein products. The researchers found that in genetic messages of a gene called FOXP1, the switch was active in embryonic stem cells but silent in “adult” cells—those that had become the specialized cells that comprise organs and perform functions. 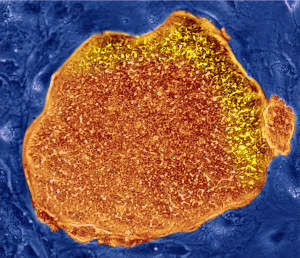 Stem cells and cancer cells seem to have more in common besides an ability to divide much more freely than normal adult cells – the persistence of structures called midbodies that are, as currently understood, important only in cell division. This raises the question of whether midbodies have functions, besides helping in cell division, that are common to both stem cells and cancer cells. Cellular structures known as midbodies, formed during cell division, appear to accumulate in stem cells and cancer cells, hinting at a potential function for these once-disregarded organelles. Midbodies, once considered the rubbish of cell division, might have a function beyond their role in getting daughter cells to separate. Researchers show in today’s Nature Cell Biology that stem cells and cancer cells collect used midbodies, whereas differentiated cells digest the organelle through autophagy. When the production of induced pluripotent stem cells (iPSCs) was achieved about five years ago, it seemed they might provide a good alternative to working with embryonic stem cells, in both research and clinical applications. Then problems showed up, such as potential tumorigenicity, inadvertent DNA damage, and incompatibilities with the source’s immune system. More recently, the alternative of “reprogramming” adult cells directly from one type (such as skin) to another type (such as neurons) has been achieved. But this newer technique has problems of its own.